Chesterfield caretaker manager Tommy Wright is keen for his future to be resolved in the coming days. 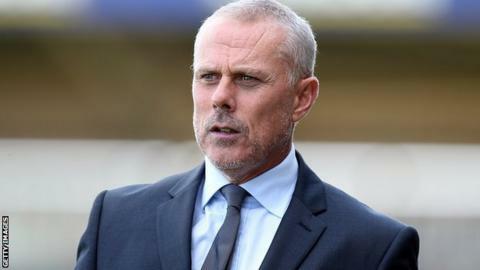 Wright has been in charge at the Proact Stadium on a temporary basis since John Sheridan was relieved of first team duties on 28 August. "There has been speculation about the situation and hopefully something will be sorted this week," Wright told BBC Radio Sheffield. "The fans need to know whether it's going to be me or someone else." He added: "Someone told me that it had been in one of the newspapers that I had been given the job but I can assure you that's not the case." Meanwhile, Wright was content with his side's performance in their Johnstone's Paint Trophy defeat by Doncaster. The Spireites, who won the competition last season, were knocked out after Jordan Ball's debut goal for Rovers. "We defended well as a group and we had some good chances on the counter attack," he continued. "We switched off for a split second and it's cost us which is a shame because our discipline was first class." "Obviously it's a major disappointment because we brought a lot of fans and we won it last season but I'm not downbeat. We had a very young team out there and there were a lot of good performances." The defeat means Wright has now lost two of his 10 games in charge of the Spireites.